Occupy Bangor's makeshift tarp tent (right), as well as another tent (foreground, left) remained in Peirce Park on Monday morning, Nov. 21, 2011. 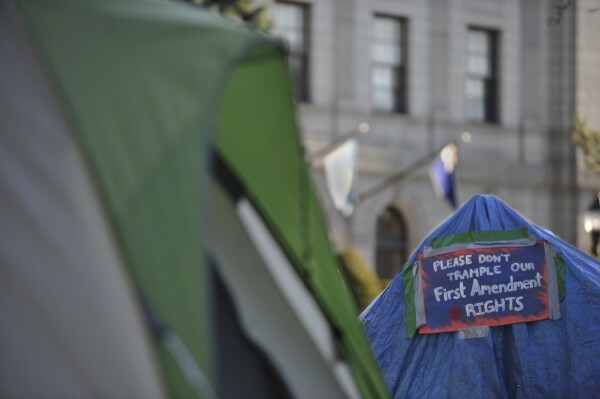 The tents were erected Sunday, and one in the foreground was occupied overnight by four participants as a First Amendment protest against city officials' request that the group remove all structures from the site by late Sunday. BANGOR, Maine — Members of Occupy Bangor are working on a temporary restraining order against the city they hope to file tomorrow or in the near future, volunteer Logan Perkins of Eddington said Tuesday. Bangor city officials say Occupy Bangor members, who have camped out at Peirce Park next to the Bangor Public Library since Oct. 29, are holding an event and need to get a city event permit, but Occupy Bangor members say the gathering is a First Amendment free speech assembly. City officials requested last week that Occupy Bangor members get an event permit by Friday, which the group failed to do, and also to remove several makeshift structures at the site by the time the park closed Sunday night. “The basic legal position [behind the protection order] is the parks ordinance and the events ordinance are unconstitutional as applied to Occupy Bangor” because of the First Amendment, said Perkins, who is a law student and helping to write the restraining order. The city is hosting a special City Council meeting at 5 p.m. Tuesday to review the city ordinances and the status and legal standing of the Occupy Bangor encampment. “It’s just a workshop for council and staff to get up to speed on terms and phrases used in relation to use of public parks and spaces in general, regardless of the user and consistent for all uses,” Bangor Mayor Cary Weston said. Whether city ordinances are constitutional is the issue, Perkins said. “The city is on notice that we have some problems with the city ordinances,” she said.